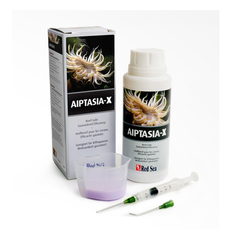 Red Sea’s Aiptasia-X treatment is completely reef-safe and any material not ingested by the Aiptasia is harmless to sessile invertebrates. Excess material will decay harmlessly over time without any adverse consequences. The Aiptasia-X® kit includes a 60ml bottle of material plus an applicator set consisting of a syringe with two (straight and angled) lock-on applicator tips, enabling treatment of even the most inaccessible of anemones. The 60ml provided in the kit should be sufficient to treat approximately 100 Aiptasia anemones. 250ml & 500ml refills are also available and are designed to be decanted in to the 60ml bottle for use with the applicator set.